Cant wait to get those stamps!!!!! and your card is lovely!!!!! I do miss my Friducha a little.... ill wait and see how the new E will work! I've been away for a few days, but had to stop by and say hello from my friend's house down here in Hampshire! LOVE this teacher card Emma. You are are SO clever . The apple is fantastic and the DP is perfect! 'See' you soon! Oooh very cute! I wish my students knew about the Cricut and made this for me. :P I'll have to do this for my girls' teachers when they reach school-age. The colours are awesome! Thx for sharing. Super cute, Emma! I'm loving that Hopscotch paper. 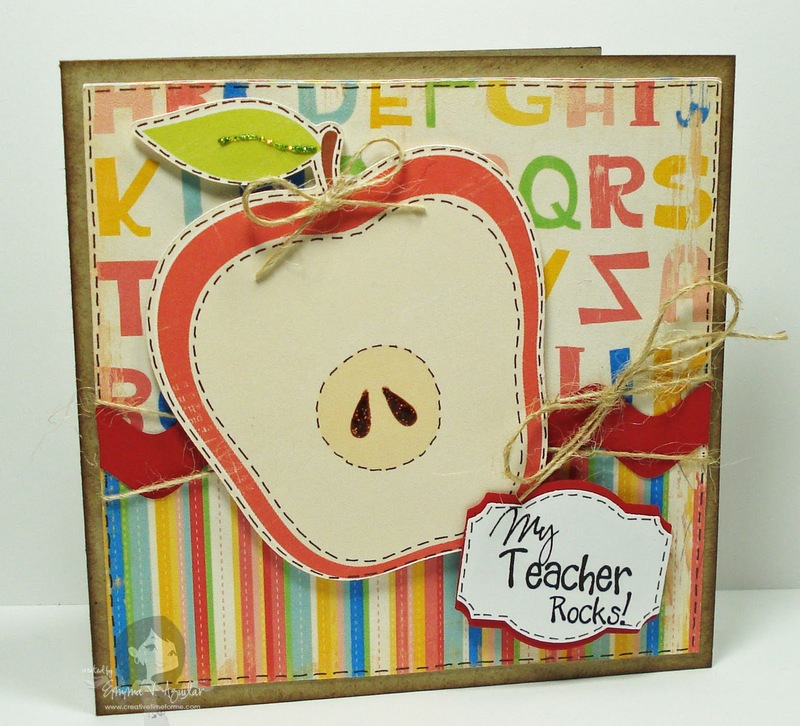 It is so perfect for your teacher theme! Super wonderful card, love it!!! Thanks for the tip about making a layer for the punch. I have always wanted to add the layered look to my punches!!! Thanks for the video and have a fabulous day!! Emma your card is sooo cute,Thanks for a little video and idea.Have a great day! Great card The paper choice is awesome The colors are perfect. Don't have either of those cartridges but need to put on my wish list. I love your card. I wish I had an Imagine. My entry is #2. Thanks for the challenge. Loved your imagine card. Very cute. Just wanted to also tell you that I love your new stamps. I've missed you. Hope all is well. Oh this card is great! I love the extra tip on the punch too! i finally got my Imagine hooked up... hopefully I can get to using it! We have been non stop of some sort of illness in our house too! Hope everyone is back to normal at your house! Your card is so super cute! I love all of your stamps... they are lots of fun! Love your card....too cute!! Loving that Hopscotch paper!! Cute card Emma as always!! I had fun playing in the challenge! !